It is interesting to read of the several approaches that were made to the Volksraad in the 1850’s for a town to be established beside Elandspoort. The applications were made by the Commandant-General, M.W. Pretorius as early as 1853 and although refused, he applied again the following year but only succeeded in 1855. The arguments for and against centred around the establishment of a “church-place” and was strengthened by the necessity of setting up a central town other than Potchefstroom the then seat of government, Lydenburg its constant opponent, and Rustenburg. “With a view to the setting up of a town on the Apies River, the Commandant-General had purchased two farms from Messrs Prinsloo and Van der Walt. The final decision was made because of the setting up of a church to be built on a suitable site”. Various forms of the name were presented – Pretorium, Pretoriusstad, Pretoriusdorp, and even Pretoria-Philadelphia – signifying brotherhood, but Pretoria was finally accepted. “A notice appeared in the Staatskoerant announcing the resolution of April 9th that Pretoria will be the seat Government as from 1st May 1860”. So it was that Pretoria had its origin in a church. Further it developed around the small Dutch Reformed Church which gave the name to Church Square. The early planners directed the Surveyor to centre the town north, south, east and west of the Church Square and churches have been the characteristic of the town and city ever since. Of later years it merited the name of “Jacaranda city” but in the 1870’s it was noted for its roses, hence the name Arcadia given to the first suburb. Carl Jeppe, an early pioneer, described the place as “the City of Roses – the whole town was drowned, smothered in these fragrant flowers for each hedge consisted of them, each verandah, each wall was clothed in them”. We will not go into great detail here but it is an interesting and frustration point to determine where the first Mass was said in the Transvaal or South African Republic. Father P. Hoendervangers, the pioneer priest in the Free State, visited Potchefstroom in 1864 in response to a sick call, but when he requested to administer the sacraments he was informed that he would be put forcibly over the border. With Father Hoendervanger’s return to Europe in 1869 he was succeeded by Father Le Bihan OMI from Basutoland who with the help of a small group petitioned the Volksraad for the repeal of the law “that no other religion but that of the Dutch Reformed Church was allowed in the South African Republic”. This was granted in 1870. 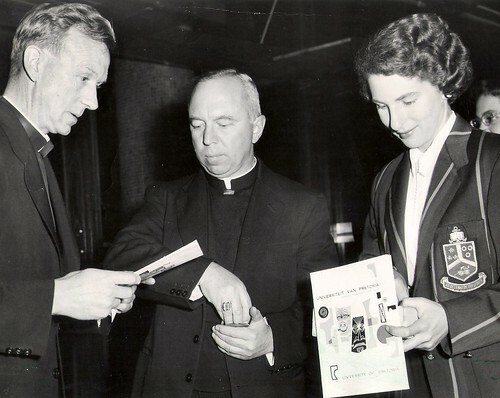 It was on this occasion that a list of donation towards Church was drawn up the first name was that of President M.W. Pretorius. His gift was a piece of ground in Pretoria situated on the corner of Potgieter and Bloed Streets – the title deeds were dated 27th November 1872. The British Annexation of the Transvaal by Sir Theophilus Shepstone took place on April 12 1877, just a century ago. Bishop C. Jolivet of Natal, whose territory extended as far as the Orange Free State, Basutoland and the Transvaal took advantage of this situation, and through the kindness of Commissary General Strickland he journeyed up with him from Pietermaritzburg. Leaving on May 23rd after fourteen days they arrived in Pretoria on June 5th, where they were invited to lunch with the Acting Governor, Sir Theophilus Shepstone. 8 June 1877, Friday, feast of the Sacred Heart. My vestments and chalice having arrived, I can, for the first time, say Mass at Pretoria on this happy day. The Baron (de Lelys) serves my Mass. On the same day I address a petition to obtain a site for our future mission building. 9 June 1877, I dine at the Governor’s (Sir Theophilus Shepstone). 10 June 1877, I say Mass in the Camp in a small hut and dine with the officers of the 13th Regiment. 12 June 1877, I go with Melville, Surveyor General to select a suitable site. Pretoria’s first Mass then was said in the private residence of Mr.de Vogel, Postmaster General, and following Sunday Mass was offered on the site now occupied by the City Hall. Bishop Jolivet then bought a horse and set off for Lydenburg, taking six das fir the journey. He said Mass there for a small group of Catholicism, gathered by Father Walshe, and then continued his journey to Pilgrim’s Rest and offered the Holy Sacrifice in the small hut built by Father Walshe, whom he had sent there two years previously after their arrival in Port Natal. 17 July: At about 2 p.m. we arrived at Pretoria. I put up at M. . . Hotel. Such a hotel! But I have no place to go to. However things improved within a couple of weeks. 6 August: the Bishop writes. “I have left the hotel. My room is like a little Chapel. The bed disappears during the day and is divided into three seats. Colonel Montgomery had given me a Corporal Flynn to serve my Mass every morning…Sir Theophilus has granted me two excellent erven – the two I have chosen, and which he had some difficulty in giving me, as the General wanted the same erven. Sir Theophilus agreed with me that the military should not be allowed to camp so near the town, One of the erven was granted and the other exchanged for another (the one in Bloed Street). Now I think I have got position in Pretoria. Deo Gratias”. Anyone who knows Pretoria today will realise that these words of the Bishop are as true today as they were then. The present church, the third on the same site, occupies a dominant position above the centre of the city. Within its vicinity are the City Hall, the Mint, the Transvaal Museum and other magnificent buildings. Adjoining erven were granted subsequently for educational purposes, and the Loreto Sisters wisely purchased the ten remaining erven so that the Church and the Convent owned the whole block. As temporary measure a small summer house was erected in Skinner Street, the Bishop being helped by the military. An artillery wagon was loaned to cart his building materials. The place was so small that civilian and soldiers had to stand outside during Holy Mass. Such was the Bethlehem of the Catholic in Pretoria. On October 2nd the foundations of the first real mission building were started, and the first mass was said by the Bishop on the Fourth Sunday of Advent – “I say Mass for the first time today in the hall – chapel – school, our first brick building in Pretoria”. The next development was that the Bishop called Walshe to Pretoria, and a beginning was made with a small four-roomed convent. His Lordship remembered the promise he had made to the Loreto Sisters, and now wrote to Navan, Ireland, to invite them to establish a Convent and School in the Capital of the Transvaal. The story of the arrival of the pioneer group is given elsewhere in this brochure. The beginning of both the Church and school were hampered by the outbreak of war in December 1880, an attempt by the Boers to regain their freedom lost to them by the Annexation. 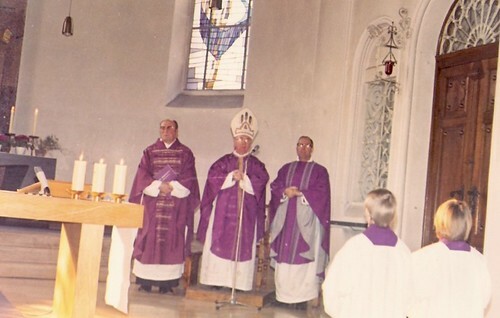 The Bishop, the Parish Priest, the Sisters and the small congregation suffered as a result. Father Walshe went as Army Chaplain and was involved in the Battle of Islandwana – he was even reported killed in action at one stage, but it was a relief when he turned up in person a few weeks later. Mother Margaret Mary, the first Superior, died in January 1881, and it was only two or three months later that her brother, Bishop Jolivet, heard the sad news. The Church and Convent grounds were turned into a redoubt in which the people were endorsed for safety. The nuns slept in the small sanctuary, the soldiers in the convent – the only two storey building in the town – and the people were accommodated in tents. This was the state of things for one hundred days. It is easy to imagine the efforts that were required to return the place to order when peace was restored. However, out of evil cometh good. The war had placed the spotlight on the Catholic community. The town and the community developed and form the initial thirteen souls in 1877 there was a need for a larger church less than a decade later. The first Church was “turned around” to serve as sacristy and sanctuary for the extension towards Skinner Street. Some or our older parishioners will remember the larger church with its Norman tower which served from 1887 to 1933. It was in the year 1886 that Bishop Jolivet succeeded in having his vast territory subdivided. From Natal he had set up churches and convent schools in the Diamond Fields, in Bloemfontein, in Basutoland as well as in the Transvaal. All this development had meant that he was continually travelling either by ox wagon, by post cart or on horseback. The South African Republic became a new Prefecture under Monsignor Odilon Monginoux OMI, while Diamond Fields and the Orange Free was erected into a Vicariate, to which was attached Basutoland, all under Bishop Anthony Ganghren, OMI. It was in the same year that the Mining Camp of the Witwatersrand – soon to be called Johannesburg – was proclaimed and the one word gold was on every lip. From a comparatively small population it developed rapidly, with peoples of every nation, travelling on foot or by every type of vehicle to try their luck on the Goldfields. This rush was followed with interest and concern by the Oblate Fathers in Pretoria and several visits were made by Father de lacy to Ferreira’s Camp seeking among the diggers for Catholics. The diary of Father Trabaud in Pretoria tells how on February 19th 1887 he travelled by wagonette – a journey of nearly eight hours – and next morning, Sunday “I said Mass in the hut of Mr. and Mrs. Whelan – Bakery of the Camp. 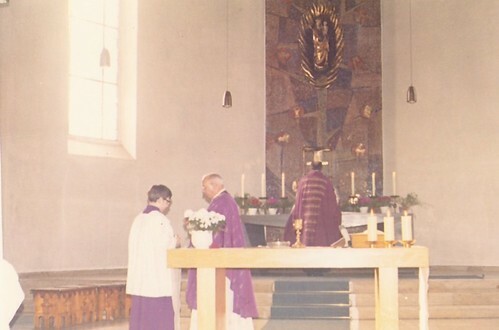 There was 33 people at that Mass and a baby – Agnes Doyle – was baptized afterwards. During the writers first years in Pretoria – 1930 onwards – I came across an account book of those early days. In clear writing are the entries for February 19th. On the credit side appeared: Collection at the Witwatersrand, £2.0.0. It was in this way that Pretoria became the spiritual Godmother of the City of Gold. On august 21st this year the Catholic Community of Johannesburg will celebrate Anniversary of the blessing and opening of the first Church on the Witwatersrand, built on the corner of Fox and Smal Streets, the present site of the fifty storey Carlton Centre. The Pretoria priests, Fathers Monginoux and De Lacy were responsible for this first Church. The close of the century saw the outbreak of the Bier War which naturally had serious effect upon the country in general, and Pretoria and the Witwatersrand in particular. Thousands of people moved away from these two centres, business was disrupted, and the economic situation of the Transvaal affected. It was a difficult time for the Church, and in fact once the cessation of hostilities was enacted and life in general slowly returned to normal the financial situation became precarious. During these years the Church lost several of her properties and in some cases the priest found himself in the salesroom bidding a price to get his Church back. In better times Father Van Laar OMI in 1896 had built a double storey presbytery in Visagie Street and the adjoining stands in Koch Street between Skinner and Visagie Streets were purchased and so in time it would have faced the present City Hall. Alas the Continental Hotel is on that site today! The presbytery was built at 399 Koch Street – in more recent times it is adjoining the present Cathedral. Father Tom Ryan OMI – still remembered in the Capital – was appointed Parish Priest in 1908. From the outset he began to collect funds for a larger church. He had ambitious plans drawn up in Amsterdam but they were never realised. It was he who began a second parish in Gezina – later to be transferred to Capital Park; the he made world-wide appeals for funds for a church at the newly established Leper Asylum at Westfort. Meanwhile the town was spreading rapidly towards the east. In 1912 the Redemptorist Fathers came to South Africa and decided to make their Monastery and Mission Centre at Pretoria. Again it was Father Ryan who chose the site and made possible a decade later the nearby Christian Brothers’ College, and the adjoining block the Loreto Convent School of Hillcrest. While the few Africans were taken care of by the priests in Koch Street, the setting up of Bantule brought about a church and school, the latter staffed by the Holy Cross Sisters who arrived in 1916. Father de Hovre began his zealous work at this Mission, and while in the beginning he cycled out every day, he soon took up residence in a small room, formerly used by the Sisters as a laundry. It was only ten feet square with lean-to which served as a kitchen and here he “lived” for over twelve years. In the summer months he rigged up a bed in a nearby tree! “Those were happy days”, he used to say, and endless crowds of Indians, Coloureds and Africans found in him a friend and a helper. One evening, on returning home, Father de Hovre found a deputation sitting around his dwelling. They had come from De Wildt to find “the true Church in Pretoria” and after a few days’ search they were directed to Bantule. It was the feast of the Epiphany – January 6th 1921 and Father saw in this coincidence the Hand of Providence. His bicycle came into use again and several times he made the journey to De Wildt and visited the people. 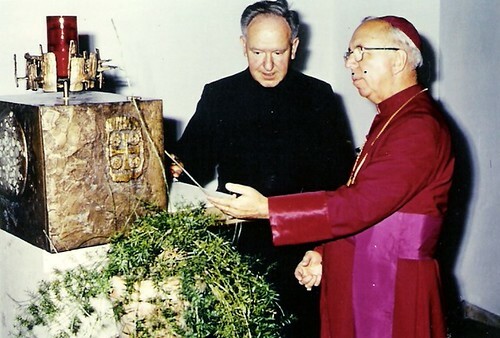 In due course a stone Church was built by one of the people, and Bishop Cox came to bless and open the building dedicated to the Most Holy Redeemer. A rondavel built behind the Church was used by Father for his overnight’s stay, until the first resident priest – Father Van Hecke – arrived. His was to be a very brief stay. Two days after Christmas he went down to the Post Office, and dropped dead at the very doorway! The Sisters of the Precious Blood from Marianhill came to De Wildt but they did not remain for long as it was felt they were too isolated from their other communities. The Holy Cross Sisters took over in 1929. In the course of time De Wildt became a centre for several other missions but today under the Stigmatine Fathers there has been an event greater development along the beautiful valley. The Sisters of Mercy extended their educational work from Johannesburg to Pretoria in 1922 and the Church of St. Columba was built alongside the new Iona Convent. The Church of St. Francis Xavier at Gezina was closed. Meanwhile the Lady Selborne are had been proclaimed, and soon Catholic children came over the Koppie, a good hour’s walk – to St. Teresa’s School in Bantule. Especially in the winter months, the plight of these children, barefooted and cold, won the heart of Father de Hovre and he began to look for a suitable site in Lady Selborne itself. The present site is the result. Three Holy Cross Sisters in a two-roomed tin shanty, which had to serve as dwelling place and school, began their uphill work in 1927. St. Thérèse had been canonized by Pope Pius XI in 1925 and two years declared Patroness of the Missions; so it is not surprising that her patronage was given to the new Mission. Who would believe that such poverty-stricken beginnings could develop into the fine church and Holy Cross Maternity Home of today. The Sisters found many friends among the people in Pretoria and every weekend journeys were made to the mission with food, blankets, school-books etc. Tens of the many thousands, from practically every part of South Africa, who visit Hammanskraal today and make use of its Conference Centre at St. Peter’s Regional Seminary, would believe the simple but hard way in which it started. About 1931 father de Hovre used to cycle the twenty –eight miles from Pretoria, often in extreme heat. Through his efforts and assistance of one of his men, David, he erected a simple oblong building to serve as a church, to which he gave the name of his own patron, St. Camillus. In between his other obligations at Bantule he would spend a few days at Hammanskraal, often with no other sustenance than half a loaf of dry bread and a small bag of peanuts. But the mission developed, a small school was started and Father’s one and only visit overseas for leave enabled him to collect funds for the development. For a few months he gave himself the luxury of a motor-bike but soon returned to his old bicycle. “When I have a puncture and breakdown I can always put the bicycle on my back and reach the mission”, he used to say. All this cycling, often with a happy-go-lucky attitude to his daily sustenance, ultimately undermined his death. In January 1936 I received a call to the mission via local storekeeper. It was Sunday morning. I found Father lying on a mattress under a tree. The iron roofed sacristy, without a ceiling was too hot. After Mass I brought Father back to Pretoria, despite his heartfelt plea “to let me die amongst my people”. The Doctor pronounced his heart had given in. He was less than twenty-four hours in the Sanatorium when he died. All his missionary life he had laboured and lived alone but there were some twenty of his fellow Oblates around his bed when the Master called him. He was only 56 years of age but in “journeyings often” he had worn himself out. A few days later when he was buried in Pretoria his African people wept and stayed on till sunset at his graveside. They had lost a Father, a Friend and the Founder of most of the Pretoria Missions. While all this development was taking place to the north and east of Pretoria, a Mission at Garsfontein was founded to the east by the Redemptorist Fathers. The first three Redemptorists who arrived in 1912 were Fathers Creagh, Burke and Kirk. In due course the Monastery Chapel, which was used initially as a Mass-centre for the small congregation, gave way to the present Church of St. Alphonsus in 1925. So rapid was the growth in the area that even this building had to be enlarged in the 1950’s. But the area was to become over and above all this, an educational centre. The site for the University was chosen. Several other schools were established, but first in the filed were the Christian brothers and then the Loreto Sisters building on ground adjoining the Monastery. Pretoria had to wait many years before it gained a Boys School. It is true that as early as outbreak of the war two years later put an end to their hopes. The Christian Brothers had begun their college in Kimberley in 1897 and for a quarter of a century it was their only establishment in South Africa. On September 8th 1922 – their Silver Jubilee year, they opened the doors of C.B.C. Pretoria. Over the years several parochial societies had been active in Pretoria. The Society of St. Vincent de Paul was established early in the century and it was Father Peron who extended the work of the Catholic Women’s League from Johannesburg during his time as Parish Priest. But it is a work of another kind for which we are also indebted to Father Peron. It was in 1932 that he encouraged Mother Angela to start Melrose Hotel in Belgravia as a residence for young ladies working in the city. This was followed by the opening of the Mazenod Hostel in Judith Paarl and then Mother Angela was invited to begin a similar place in Pretoria. This began very simply in a house opposite the Presbytery in Bosman Street. The need was so great – especially then during the War that very soon a larger building was necessary. Half of the presbytery garden was acquired by the Sisters and so rosary Lodge began to grow under more favourable conditions. Hundreds of young ladies, mostly from other parts of the country, away from their homes and families and now transferred to Pretoria found in rosary Lodge not only a residence but a home from home and safety and guidance from the Sisters. This work continued for forty years and only last year ceased to operate when the building was taken over as the general Secretariate of the Catholic Bishop’s Conference under the name of Khanya House. In December 1922, the Sovereign Pontiff, Pope Pius XI established the Apostolic delegation in Southern Africa and the following day His Excellency archbishop B.J. Gijlswijk O.P. was consecrated as the first Apostolic Delegate. He arrived in South Africa in February 1923 and Bloemfontein, as the Centre City, was chosen for his residence. He was succeeded in October 1945 by Archbishop H.M. Lucas, S.V.D. Very soon after his arrival, early in the following year, His Excellency realized that Pretoria would be a better tended a warm welcome to the representative in South Africa of the Holy Father. Following in the footsteps of Father Tom Ryan and his ambitious schemes for a larger church in the Capital, were Father Ives Saccadas and Father W. Quinlivan, OMI. Neither were to stay long in Pretoria but in his two short years Father Ives restarts a Building Fund effort and his successor Father Quinlivan continued the good work which was interrupted by his death in May 1926. Father Louis Foley had come out to South Africa in 1924 after nearly two decades of teaching duties in Ireland. Father Quinlivan have had taught as a little boy and now he was sent to help him and ultimately succeed him in Pretoria. The years 1929-31 saw the depression everywhere and although Father Foley fully realized the need for a new Church, he continued to add to the monies already invested. However, as the financial debacle continued he was advised “build now”. The advice was trustworthy and was indicated by the fact that no less than twenty-nine tenders were received, come as far away as Cape Town. The Building trade, like today, was at low ebb. The tender, thirteenth on the list, of Alexander Bennett at £26,500 was accepted. The first Mass in 1877 was offered on the feast of the Sacred Heart of Jesus, and on October 17th 1932, the feast of St. Margaret Mary, the great devotee of devotion to the Sacred Heart, saw the first step, when the ground was tested and levels taken,. By November Mr. Bennett had completed his contract of building the Metro Theatre in Johannesburg and he arrived in Pretoria ready for the new contract. Father Foley had fear of debt and fought shy of these even thousand pounds which was wanting to full payment. He undertook to build only the nave of the Church, sanctuary and choir gallery would have to wait. We wonder today at this decision and after all £7 000, even with interest, would have been small indeed. But Pretoria and its community then was quite different in size to our day. Time was to show that seven thousand was to multiply several times. The Sanctuary was built by Father Peron in 1940 and cost 11 000, while the remainder and completion of the plan was only realized in the 1950’s. The final and total cost was nearly 50 000. Of course the World War II put up building prices several times over! Let us return to 1932. On August 21st Father Foley had the ceremony of “turning the first sod” on the site. That morning he preached at all five Masses on the dignity of marriage and the sacrifices involved. He had invited all the families of nine or more children – he was one of nine himself – to have representative in that ceremony. There were 24 in all. A photo was taken and sent to the Holy Father and later each family received a Special Blessing. On New Year’s Day 1933, the ceremony of the laying and blessing of the foundation stone was performed by Bishop O’Leary, assisted by Fathers Brady and O’Callaghan OMI. The foundations and walls, to a height of a few feet, had already been built around the existing church still in use, but on January 5th, demolition of the old church began and the Convent Hall was used as a temporary church during the following months. The Catholic Community took shape and everything had been judged by their previous small church. The material for the building was to a certain extent experimental. It was constructed of concrete blocks with a facing of crushed marble chips. The ceiling was of fibrous plaster with an oak-beam like finish. Gradually the edifice took shape and everything was ready the windows. These were to be quite a feature, long and narrow with shaped mullions each presented a picture of one or other incident in the earthly life of Christ. The front window especially drew quite a good deal of attention and admiration – it portrayed Christ weeping over Jerusalem. It was Father Peron who shortly after building the Sanctuary completed the windows with the Crucifixion Scene. At long last the great day arrived for the opening and blessing of the church. Again, Bishop O’Leary officiated on Sunday, December 10th, following the feast of the Immaculate Conception. Prelates from other parts of South Africa were invited to attend. 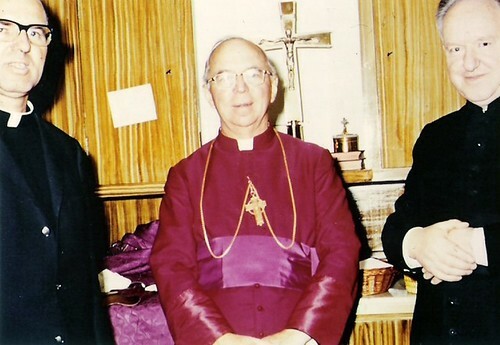 Bishop MacSherry of Port Elizabeth was the preacher while Bishop Delalle of Natal, Bishop Meysing of Kimberley, Mgr. Van Nuffel of Pietersburg, Mgr. Mohn of Lydenburg were in the procession. Some twenty-five priests also attended while in the congregation there was standing room only. 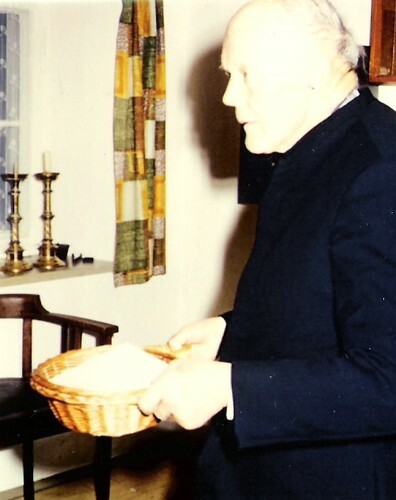 Father Foley appealed to his people to be generous in that morning’s collection so as to pay for the initial number of benches – people responded with £500 0.0. While all this was taking place in Pretoria in December 1933, another event was happening in Rome where a young student, originally from the Transkei, a pupil of C.B.C. Kimberley, and sent forward for priesthood from Cape Town, was ordained priest on December 23rd, just two weeks after the opening of Pretoria Church. Little did we realize or did the young priest that in due course he would be appointed the first Vicar Apostolic of Pretoria in 1948, and three years later the first Archbishop and Metropolitan of the Province of Pretoria. This was Father John Colburn Garner. That same year a baby was born to the Daniel family in Pretoria, one “who waxed strong in wisdom and age” and who in August 1975 was to be consecrated Archbishop to succeed Archbishop J.C. Garner. All who leave the present Cathedral by the north doors cannot help but notice a marble plaque which lists the pioneer priests in the Capital City. At its head carved the Oblate coat of arms, recalling to all that for seventy years the Sons of De Mazenod labored there. The name of Bishop Jolivet heads the list as the Founder and Father Andrew Walshe as the first Parish priest. Names like N. Meyer, J. de Lacy, L. Trabaud, O.Monginoux, Serriere, Vigniron, Charmard, Van Laar, Hammer, T. Ryan, C. de Hovre, Quinlivan Foley and others follow. This commemorative plaque was inscribed and erected in June 1947 when we held a week of celebrations for the seventieth anniversary of the First Mass. Special Masses, a preached novena, a historical exhibition and a gathering of prelates from many parts of South Africa enhanced the celebrations. At this time and date the Centenary seemed a long time off. Would any of us ever see it? Yet here is realization of our plans and even our ambitions. There is much to thank God for and we have endeavoured to pay tribute to the pioneers, priests, religious and laity. We recall as fitting the words of the Apostle, “I have planted, Apollo watered, but God gives the increase. Therefore, neither he that plants is anything, nor he that waters, but God that gives the increase.” 1 Cor.3:6 & 7.